We designed this coach to go on the roads less traveled. With an overall length of 37ft and the incredible turning radius of the Freightliner M2. This coach will absolutely amaze you with its maneuverability. 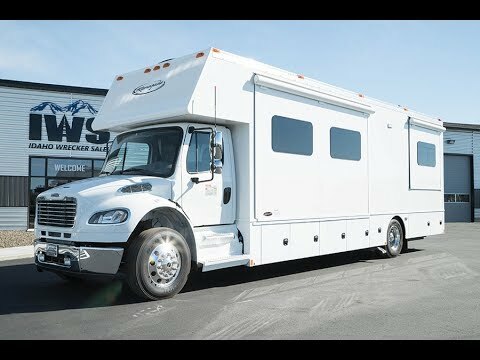 We selected the Freightliner M2 chassis because it has a 55-degree wheel cut and has the best turning radius of any chassis we have seen. We right-sized the power by selecting the Cummins ISL9 engine and backing it with an Allison Transmission. This Chassis is loaded with options like a 2 stage exhaust brake, air ride rear suspension, air brakes and a 20,000lb rated trailer hitch. 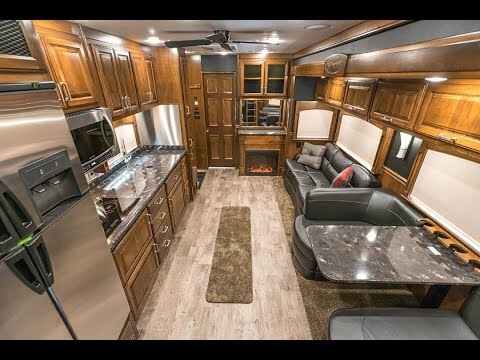 For the coach portion, we used the Renegade Classic and had the walls and Ceiling coated with our IWS Arctic Insulation Package. A customer once said, “You can cool this coach with an ice cube and heat it with a match”. Of course that an overstatement, but this coach will truly impress you with its insulation properties and sound-proofing ability. We equipped the interior with lots of amenities but tried to keep function at the top of the list. All of the furniture is FlexSteel with upgraded Ultra Leather Fabric. For The walls, we chose Stained Maple Wainscoting thought the coach with a Black Padded Wall Covering. For the flooring, we chose our IWS exclusive DR161 Resilient Vinyl Flooring. This flooring has proven itself over the years to be easy to clean and still have great wear qualities. Our hope is that when you enter this coach you will feel like you’ve entered a mountain Lodge. If you are interested in learning more, please give us a call. Freightliner M2 Fiberglass Tank Covers Painted To Match Cab. Upgraded Ultra Leather Package For Flexsteel Dinette, Flexsteel Sofa, Captains Chairs. Upgrade to 8-D AGM Maintenance Free Sealed Battery 1850 Est- C.C.A. Quick Disconnect LP Coupler In Storage Compartment. 32″ Smart TV – Blu-Ray / DVD Player with Satellite Prep For Bedroom. IWS Signature Series In Cab Stereo System Includes Alpine 7″ INE-W957HD In-dash Stereo, CD /DVD Player. Includes Pandora, SiriusXM Radio with Navigation also Includes I-Phone Siri Eyes Free and Bluetooth. (1) Amplifier, (4) Mid-Range Speakers with Crossovers, (4) Tweeters and Powered Sub Woofer.